This study examines the organization of architectural production at Cueva Bringas and Cueva el Aguaje, two prehispanic coursed-adobe cliff dwellings in the Northern Sierra (Casas Grandes) region of northeastern Sonora, Mexico. Since there are no archaeological models of the organization of domestic architectural production, an ethnographic study was completed to establish a set of expectations for this data set. The results of this study found that architecture is primarily built by groups whose members are not part of the household intending to occupy the structure. In addition, architectural production varies by gender of the producer, level of complexity, production step, and material type. This study takes a technological approach to architecture, moving beyond questions tied to room use, residence and descent rules, and population estimates of those who occupied the structure, to the labor organization of those who built the structure. Toward this end, subtle differences in dimensions and material composition of adobe architecture at Cueva Bringas and Cueva el Aguaje were analyzed. This analysis has four parts. 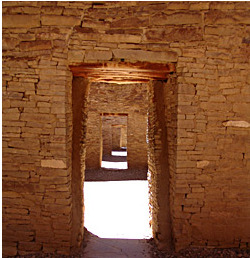 First, construction techniques and types of architectural features present at the two study sites are compared to the same attributes at eight sites in the greater Southwest, placing these relatively unknown sites in regional archaeological context. Second, the construction sequence at each site is established using abutment relationships and spatial distributions of adobe types. These relationships suggest that both sites were constructed in a year or less. Third, the function of each room is established and grouped into potential household suites. This analysis suggests that each site was occupied by approximately 10 households, and about 50 people. Finally, a statistical analysis of architectural dimensions finds that while architectural production at Cueva Bringas and Cueva el Aguaje was probably not specialized, production at the regional center of Paquimé may have been. In addition, the products of specific architectural production groups were identified. The spatial distribution of these products across each site, suggests that the architecture at both sites was produced by an entire community working simultaneously. Individual households were not built by their future occupants. These results suggest that Cueva Bringas and Cueva el Aguaje were planned colonies, sent from a larger community. Further, this study demonstrates that architecture reflects both the people who used the architecture as well as the people who built the architecture, but these groups were not always the same people or organized in the same way.